Current: Who Are the Palestinians? What is the source of the name “Palestine?” It is not Arab; it is derived from the name “Palestina,” by which the Roman Emperor Hadrian chose to call the land after the defeat of the Bar Kokhba Revolt in 135 CE. His aim was to erase “Judea” and negate any connection of the land’s history and identity with the Jews.6 This denial of the land’s Jewish roots has regrettably been continued to the present day by today’s Palestinians. When the Islamic armies conquered the land, they adopted the administrative name used by the Byzantines and dubbed part of Palestina Prima (“the first Palestine”) – more or less today’s Jerusalem area and the Shfela [coastal plain] – as “Jund Filastin.”7 Jund means “army;” Jund Filastin means “the Palestine military command.” In other words, the name did not signify the national identity of a “Palestinian people” who lived in the land, but instead, a military district, in line with the Byzantine nomenclature. The hub of Jund Filastin was the town of Ramle, not Jerusalem; the intention was apparently to protect the trade routes leading from Egypt to Syria and Iraq. The first generation of the Palestinian Muslim leadership took part in the Great Arab Revolt of the Hashemites in 1916. Palestinian leaders were members of the Hashemite administration in Syria, and it was only after King Faisal’s reign collapsed that they came to Palestine. The Arabs of British Mandatory Palestine (1918-1948), then, had been exposed to competing narratives by which they could construct their political identity.9 Haj Amin al-Husseini, for example, was an Ottoman officer, but he joined the Hashemite army as a recruiter.10 Another figure from those days was Aref al-Aref, a supporter of the Hashemite regime in Damascus who orchestrated the April 1920 Nabi Musa riots in Jerusalem as a way of honoring the reinstatement of the Hashemite Faisal’s government. 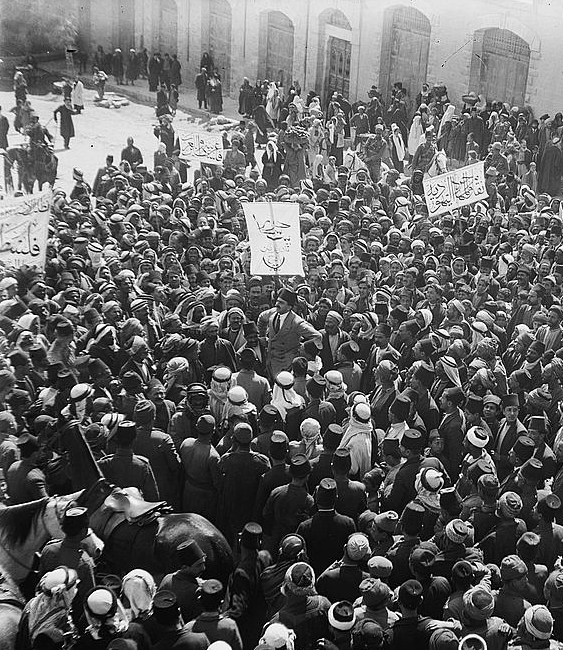 In 1919, al-Aref edited a Jerusalem-based publication called “Southern Syria.” At the 1920 riots, Haj Amin al-Husseini held up a portrait of King Faisal of Syria and showed it to the Jerusalem Arab crowd: “This is your King!” The crowd responded: “God Save the King!”11 The focus of much of the protest at the time was on the imposed separation of British Mandatory Palestine from Syria, which came under a French Mandate. The goal was reunification not Palestinian independence. As long as Palestinians saw themselves as part of Syria, they were not aware of their Palestinian identity. Adnan Abu Odeh, a senior Jordanian statesman of Palestinian extraction, wrote about Palestinian-Jordanian relations and made a distinction between the two peoples. In his view, the difference between Jordanians and Palestinians does not necessarily lie in how they define their identity but in how others define them.12 This distinction emerged, he maintains, when the British established the Emirate of Transjordan, which defined the Jordanians, and designated Palestine as the Jewish national home, thereby defining the Arabs who lived in the territory allocated to the Jews as Palestinians. Jordanians: Jordanian citizens of whatever origin. Thus, the national definition of the Palestinians stemmed from the borders that the Western powers carved out, whereas, after the First World War, they defined themselves as part of the short-lived Hashemite regime in Syria. A remnant of those early days is the flag of Palestine, which is actually the flag of the Great Arab Revolt of the Hashemites.13 It still serves as the official flag of the Syrian Baath Party and was only adopted as the official flag of Palestine at the PLO congress of 1964.14 In any case, the flag’s colors represent symbols from Islamic history and are in no way specifically linked with the Palestinians. The flag of Palestine is, then, one of the flags of “Greater Syria.” It expresses a pan-Arab commitment, which the flags of Jordan, the Baath Party, and the Hashemites during their short-lived regime in Syria also upheld. When Nabil Shaath, head of the PLO’s foreign relations department, explained why they oppose the 1917 Balfour Declaration, he described Jewish history as “a potpourri of legends and fabrications.”17 Britain had awarded the country to those who had no bond with it whatsoever. “[The Jews] he said, “have no connection with the country, neither in distant nor in more recent history. Britain destroyed Palestine and cleared the path for the colonialist settlers instead of the real owners of the country. That is history,” declared Shaath. This narrative is directly linked with the outrageous UNESCO resolutions that sever the bonds between the Jewish People and the cities of Jerusalem and Hebron. Some time ago, in one of the West Bank cities, I talked with a retired Palestinian teacher about the Canaanites. He claimed that they were a Yemenite Arab tribe that settled in Palestine and that the Israelites when they conquered the country, did not build a single new city or village; all the cities are Canaanite cities. According to the Torah – so the Palestinian teacher claimed as well – Ishmael (Abraham’s son) was the firstborn, not Isaac. God’s promise to Abraham pertained to Ishmael and not to Israel, he insisted. One theory associates the Canaanites with the tribe of Amalek,18 hated by the Israelites. It posits that the Canaanites were among the Amalekites’ descendants, and that “explains” why the Jews want to annihilate the Palestinians. Thus, linking the Palestinians with Canaan reflects an uncompromising attitude of all-out war. Palestinian scholar Khairiya Qassemiya wrote in the PLO’s journal that the Palestinians’ disengagement from Syria was difficult for them because they then had to contend alone, without the Arabs, against the Zionists. King Faisal, she wrote, opposed severing Palestine from Syria, and in doing so set the stage for the ongoing opposition of all Syrian governments to creating a separate Palestinian state that is detached from Greater Syria. The collapse of Faisal’s government, however, cut the Palestinians off from Syria19 and forced them to seek separate roots for their identity; thus, the Canaanite ethos was born. In Nablus, there is a family named Kanaan – that is, Canaan. We asked members of the family about its lineage, and they affirmed that they had been Canaanites for 3,000 years. However, a look at the family’s website gave a different picture.22 It is indeed an ancient family – part of it Christian, indicating its pre-Islamic origin; but coming from Aleppo in Syria. From Aleppo, the family branched out to Damascus, Cyprus, and other places, including Nablus. Although the name may indicate Canaanite ancestry, the Canaanite forebears were in Syria, not in the land of Canaan. According to another source within the family, the clan originated in Homs,23 Syria and became widely dispersed in the Middle East, apparently including Nablus, about 300 years ago. Despite the fact that the name suggests a Canaanite lineage, this source says the family’s origins lie in the ancient Arab Tamim24 tribe. Thus, apart from the Kanaan family with its possible Canaanite ancestry coming from Syria, not Palestine, and its possible Arab origins, there is no direct or indirect evidence of the Palestinians having descended from the Canaanite people as they claim. In other words, Erekat’s claimed Canaanite roots entail that he cannot recognize Jewish history; and in any case, Joshua bin Nun, Erekat intimates, was a war criminal. Is the Erekat family “Canaanite,” as he angrily insisted to Tzipi Livni before a European audience that did not bat an eyelash? To find out how the family views its lineage, we looked at his family’s genealogical sites. It turns out that the Erekat family originates in the large Huweitat tribe, and they belong to the Ashraf (families that trace their lineage to the family of the Prophet). They are related to the descendants of Hussein, grandson of the Prophet, who migrated from Medina to the Syrian Desert and settled in the Aqaba area. The Erekat family itself settled in Abu Dis, Jericho, Amman, and Ajloun (in Jordan). The sheikh of the family was Kamal Erekat, commander of the jihad against the nascent Jewish state in 1948 after Abd al-Kader al-Husseini was killed in the Battle of Kastel during Israel’s War of Independence. Kamal Erekat himself was wounded in the war and later became the first speaker of the Jordanian parliament. In general, the list of heads of the Erekat family includes many Jordanian cabinet ministers. Why is the family so prominent in Jordan? Because the Huweitat tribe was among the main tribes that backed the Great Arab Revolt of the Hashemites in Mecca, and it moved north along with Laurence of Arabia —that is, at the same time as the Zionists were establishing themselves in Palestine. As Adnan Abu Odeh observed, the definition of the Arabs as Palestinians stemmed from how the British identified the land – that is, from how foreigners, not necessarily Arabs, referred to the area. During and before the Ottoman Empire, Arab tribes were defined as Qays and Yaman – that is, the tribes of the “northern” Arabian Peninsula and the tribes of “Yemen.” That dichotomy characterized the disputes between the Arab tribes long before Islam began. It stemmed from the massive northward migration of the Yemenite tribes after a traumatic event in Yemen’s ancient history – the collapse of the Great Ma’rib Dam sometime between 570 and 575 CE. Those migrations were not typical of Palestine, which had not yet emerged, but rather of the Middle East as a whole, and in this regard, the Palestinian tribes were no different from the region in general. Nablus was known in the days of the Canaanites as “Shechem” [the Hebrew name], and it was unimportant. The Israelites conquered it easily, and after that, the Assyrians deported them to Iraq, and Iraqis settled in it. In the days of Rome, the city rebelled, and the Romans destroyed it and rebuilt it and called it Neapolis, the new city…. Until the Muslims conquered it, its residents were an assortment of Christian Arabs, Samaritans, Arab governors, and soldiers… Subsequently, Nablus got caught up in events in Syria, and I have devoted a chapter to the events in Syria because of [Nablus’] connection with this history. Thus, according to this book on the history of Nablus, the references to the Canaanites are chronological rather than actual, and the Canaanites have left no trace in the current demography of the city. Among the prominent tribes is that of the Barghoutis, from whose ranks have come Marwan Barghouti and other well-known figures. In a conversation with a member of the family many years ago, he told me that the Barghouti family symbolizes sumud – remaining steadfastly on the land. The family originally was Jewish, he said, and they converted to Christianity during the Byzantine Empire, and then, when Islam arrived, to Islam. Originally, the Haddadin tribe was Yemenite, and it was forced to leave pre-Muslim Yemen at the time of the Jewish king, Dhu Nuwas (455-510 CE), to avoid converting to Judaism and to maintain their Christianity.33 Today, the Haddadin is one of Jordan’s important tribes, and its members hold senior positions in the Hashemite government; an example is Munzer Haddadin, who headed the Jordanian delegation to the talks on water with Israel. A source in Mount Hebron told me once that the Mount Hebron villagers call the residents of Hebron “the Jews.” Although the families of Hebron do not regard themselves as having Jewish ancestry, in the Mount Hebron villages there are traditions with Jewish origins. The most notable examples are the village of Yatta – the Biblical Juttah – and particularly among the Makhamra family. When Arab families investigate their origins, they tend to associate themselves with a glorious chapter of Islam. The Huweitat family claims to be descended from the Imam Ali.43 One should take this affiliation with a grain of salt since honor considerations of the tribes lead them to seek honorable origins. However, when it comes to the ascriptions of the Arab tribes of Hebron, there are independent testimonies that the Tamim, a major Arab tribe, indeed has honorable origins connected with the dawn of Islam before the seventh-century conquest of the country. The tribe’s traditions, as well as other Islamic sources, such as the books of the Hadith, assert that the Hebronite Tamim family is among the descendants of the friend of the Prophet, Aws, from Medina days, and that the Muhammed gave him and his descendants Hebron as a patrimony – Habrun or Habra in the Hadith.44 Aws had no sons, but his daughter, Rukiyah, married a member of the Dar family, and the full name of the family is Tamim-Dari. The family’s pre-Islamic origin was Yemenite. It converted to Christianity, and when the Prophet Muhammed came to Medina, the family came to him from “Hebron” (not al-Khalil) to convert to Islam. The family received Hebron and its neighboring villages from Muhammed as a patrimony. Whereas the Tamimi tribe consolidated the Arab origins of Hebron, there are testimonies by Hebronites themselves that half of the city is of Kurdish origins. Who Are the Canaanites’ Descendants? Of late, the Palestinian leadership has been repeating the theme that the Palestinians are descended from the Canaanites. Because it keeps reiterating this narrative, there is a concern that some in the West will fall for it. The purpose of the “Canaanite” narrative, however, is not to shed light on the Palestinians’ real ancestry, but to deny the Jews’ narrative. Why the Canaanites? Because they were in the country before the Israelite tribes were and thus have precedence. According to Nabil Shaath, Jewish history is but a “potpourri of legends and fabrications.” The Canaanite narrative cannot promote reconciliation and compromise but only the destruction of the Israeli-Jewish narrative, according to the same principle by which the various communities are now destroying each other in Syria. Hence, it is important to clarify how the Palestinians themselves view their own ancestry. Indeed, not a single Palestinian tribe identifies its roots in Canaan; instead, they all see themselves as proud Arabs descended from the most notable Arab tribes of the Hejaz, today’s Iraq, or Yemen. Even the Kanaan family of Nablus locates its origins in Syria. Some families are Kurdish or Egyptian, and in Mount Hebron, there are traditions about Jewish origins. This study does not deny the right of the Palestinian families as a whole to define themselves as a Palestinian people. It would be better, however, if the Palestinian leadership were to choose a positive and constructive narrative and not a baseless one that is intended to negate that of the other. My Palestinian homeland has a long history as a lighthouse to all the peoples; our people is an offshoot of the Canaanite people who lived 3,500 years ago. Our country, which has already existed for thousands of years, included the first agricultural community in human history in Jericho, as well as the most ancient city, Jerusalem, the city of peace. 4 Video: “Ḥamas Minister of the Interior and of National Security Fathi Hammad Slams Egypt over Fuel Shortage in Gaza Strip, and Says: ‘Half of the Palestinians Are Egyptians and the Other Half Are Saudis,’” Al-Hekma TV (Egypt), March 23, 2012, http://www.memritv.org/clip/ en/3389.htm. 7 https://ar.wikipedia.org/wiki/جند_فلسطين A History of Palestine, 634-1099; Moshe Gil; pg. 111 – best replacement? 9 Khalidi, Rashid, Palestinian Identity: The Construction of Modern National Consciousness, Columbia University Press, New York, 1997. p. 11-12. 15 http://elkashif.net/site/news/14211#sthash.hRWZsvul.dpuf. Saeb Erekat defines Palestinian nationalism as belonging to pan-Arabism in opposition to the Kurds, who seek to divide the great Arab homeland. 17 Radio Palestine, April 23, 2017. 21 Munib al-Masri of Nablus placed in the living room of his villa a statue of an ancient Greek fighter that he had purchased in Crete, thereby seeking to express the Palestinians’ Philistine ancestry. In a conversation with him, however, he himself admits that the origins of the Masri family of Nablus lie in the Arab tribes of Yemen. 31 http://www.asrawi.com/main/?p=10. The site is associated with a different family that is close to Barghouti and distantly related to him. According to the ascription, the family originated in the Hejaz and converted to Christianity in the pre-Islamic period. يذكر ان عائلة المخامرة اصلهم يهود وقد جرى اثبات ذلك في الامم المتحدة، وجرى تسجيل يطا كبلدة يهودية عام 1947 ويقال ان جميع سكان يطا من اصل يهودي. يذكر ان السموع وعائلة المحاريق والكرمل وسوسيا وبني نعيم وقبائل التعامرة والرشايدة والعزازمة هم ايضا يهود.